Christmas home tour full of vintage and DIY decor - Lovely Etc. I absolutely love decorating for Christmas – there’s nothing as cozy as a Christmas tree full of lights twinkling in the corner. Every year I love pulling out my Christmas decor and being flooded with memories from past Christmases. I almost never buy anything new but I love to challenge myself to find new ways to use my same old favorites. 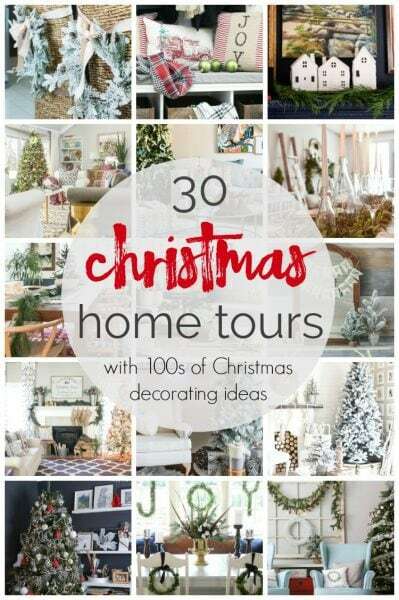 And since Christmas decorating is my favorite, I asked some of my favorite creative bloggers to join me in sharing their Christmas decorating. I love that everyone has their own style and their own take on Christmas decor. 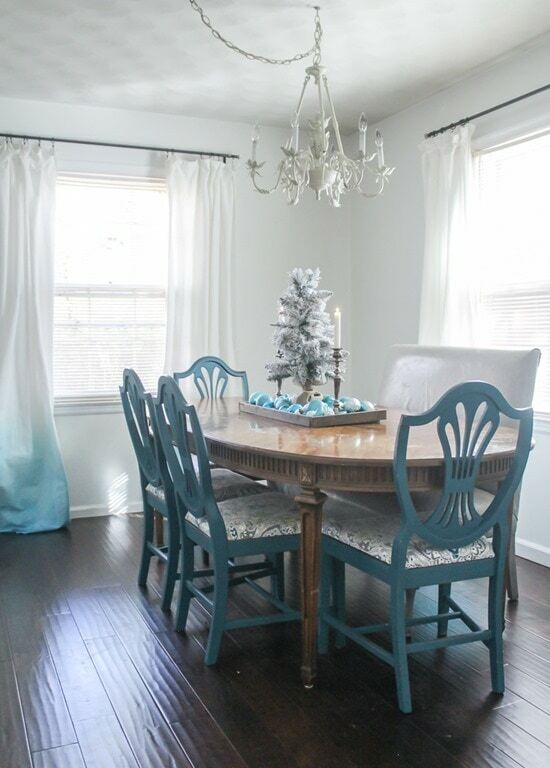 You can see all the fun Christmas decorating styles at the bottom of this post. Plus, we have an awesome giveaway for you guys. We’ve joined together to give one lucky reader $300 Paypal cash just in time for the holidays! Woo-hoo! Don’t forget to enter at the bottom of this post. Now I can’t wait to invite you in to celebrate a bit of Christmas with me! Welcome to my home! I recently switched around some furniture and brought this cute metal table back to the entry. I love the curves of the table against the straight lines of the wall. 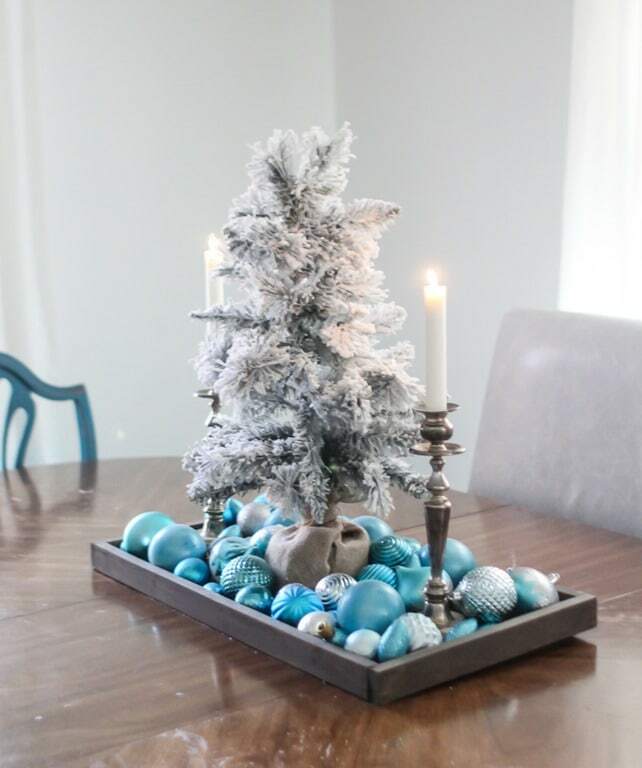 This year I picked up some inexpensive mini Christmas trees and added my favorite flocking to them to use throughout the house. 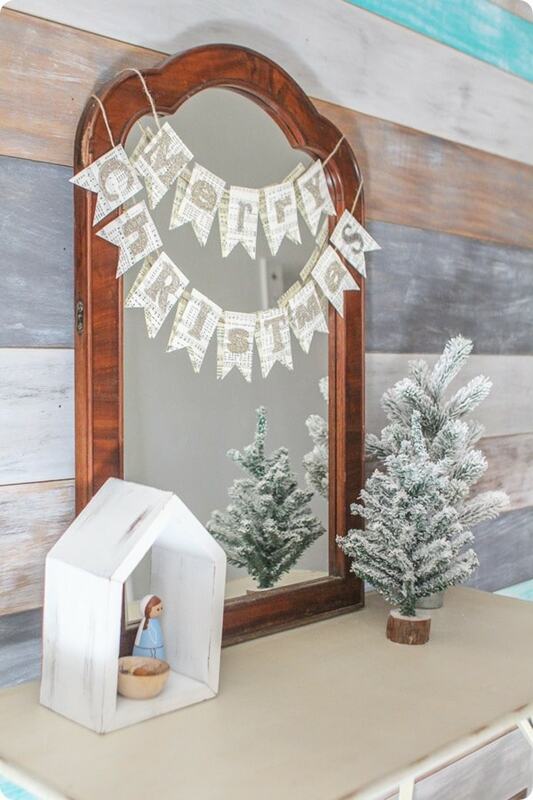 I also added a thrifted vintage mirror and our peg doll nativity. 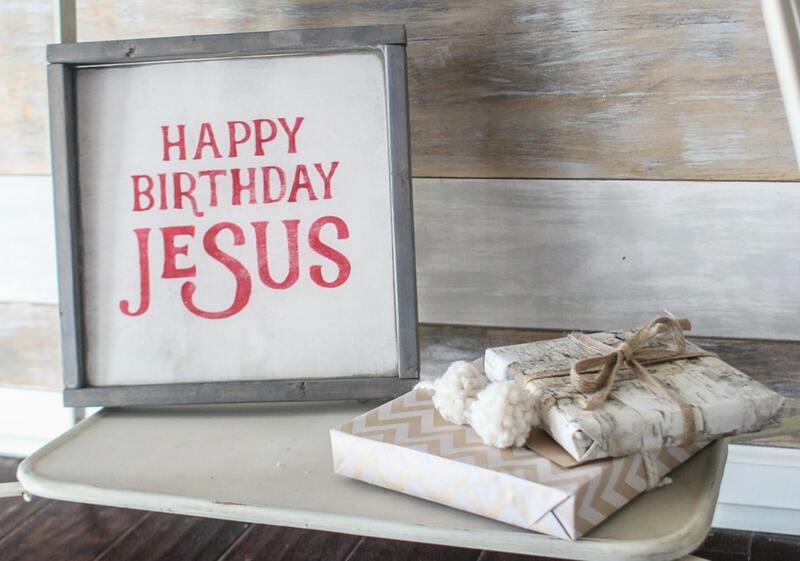 The cute little Merry Christmas banner was a quick DIY project. I cut the pennants from an old hymnal but I have free printable Christmas music here if you don’t have your own stash of old hymnals. Then I glued on glittered chipboard letters. I also added a few touches of Christmas in our living room. I made this cute Thankful sign for fall, but since thankfulness isn’t actually limited to one season, I wanted to keep it around for Christmas. I switched out the photos for some of my favorite photos of my boys from past Christmases. I added a few of my favorites from my vintage camera collection below the sign. 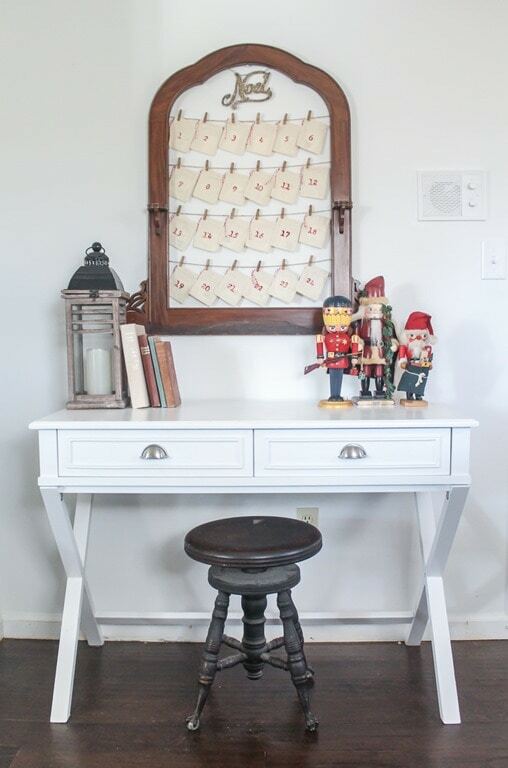 And look closely at the photo above – do you see the little letterpress letters that spell smile? I put a few more small flocked trees in our bay window along with a cute lantern. I always struggle with what to put in that window that will look good from the outside as well as the inside. This seemed like the perfect solution. Plus they are so pretty all lit up at night. And did you see? I finally got a new couch! Yep, after searching for the perfect affordable sofa for well over a year, I finally chose this cute gray Chesterfield from World Market. I picked it up during one of their fabulous furniture sales and so far we are loving it! In the dining room, I added a super simple centerpiece to the table. I love to see a gorgeous table all set with beautiful dishes, but that just doesn’t work in our house. My boys would destroy it in minutes. So instead I just went with a cute centerpiece. Another flocked tree, a tray, a pair of vintage candlesticks, and a huge pile of shatterproof ornaments. And my DIY advent calendar also found a new home this year. I am loving the vintage stool and frame against the modern white table. 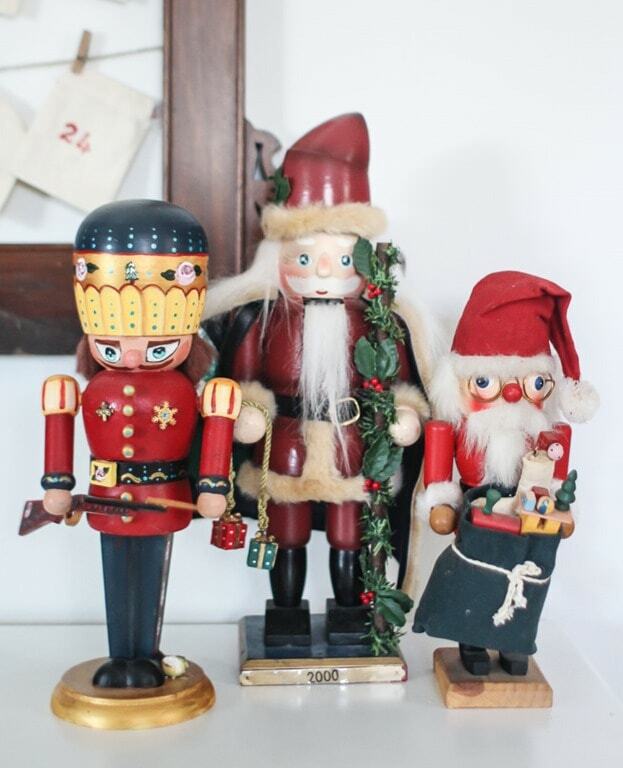 And of course, we can’t decorate for Christmas around here without a few nutcrackers making an appearance. My husband’s grandmother gave him a nutcracker every year for Christmas and I have carried on the tradition until now we have a huge collection. These three are a few of my favorites so they get a place of honor beside the advent calendar. Tomorrow I’ll be back sharing how I pulled together a beautiful Christmas mantel despite the big TV hanging over the fireplace. And of course I’ll be sharing more about our Christmas tree soon too. But for now, check out how these stylish ladies decorate for Christmas! Enter below for your chance to win $300 Paypal cash just in time for the holidays. Open to U.S. residents 18 and up. There are lots of ways to enter to increase your chances of winning! Carrie, I love your Christmas look! And that advent calendar is adorable. I just love it! 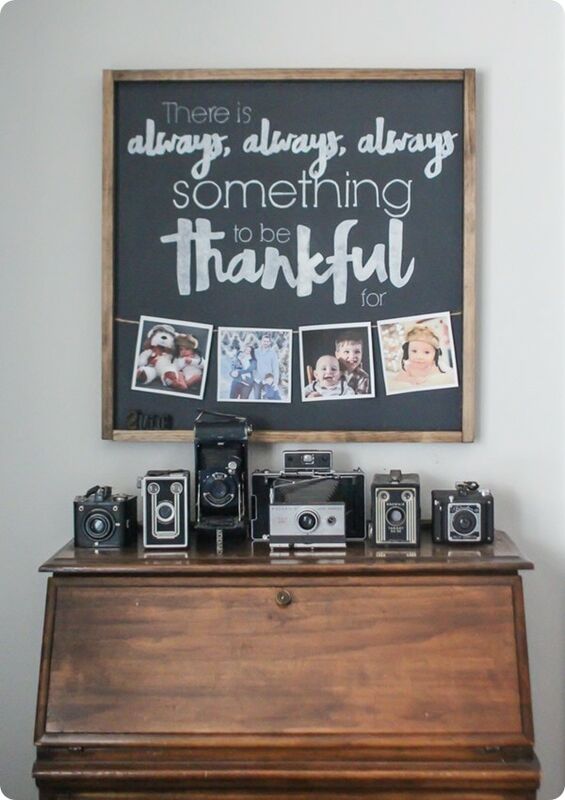 I absolutely adore your foyer vignette and your vintage camera collection. You always present such a welcoming and thoughtful space. Thanks Erica, you are so sweet! One of the nice things about having been blogging for awhile is seeing the same people’s Christmas tours year and after year and checking out what they’ve changed and what’s stayed the same….I always love to see which nutcrackers come out every year in your tours! I agree Gretchen – I love seeing how things evolve! Aw thanks Cassie! I really love that one. Oh my gosh! So warm and inviting! Carrie your traditional vibes make Christmas so exciting and reminiscent. Beautiful tour! I am loving all of your classic Christmas touches! I’m a traditional Christmas girl at heart, so I love your advent calendar, nativity set and nutcrackers :) Such a beautiful home. Happy Holidays! Thanks so much Jen! Sometimes I’m really feeling classic and sometimes not so much but it’s so fun to get to do Christmas however we choose! Thank you so much Kathy! I’m happy you could join in! 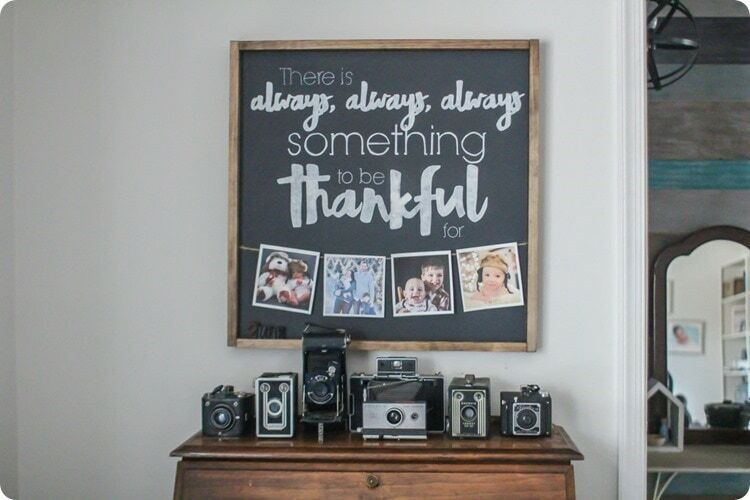 Wonderful decorations throughout your home! 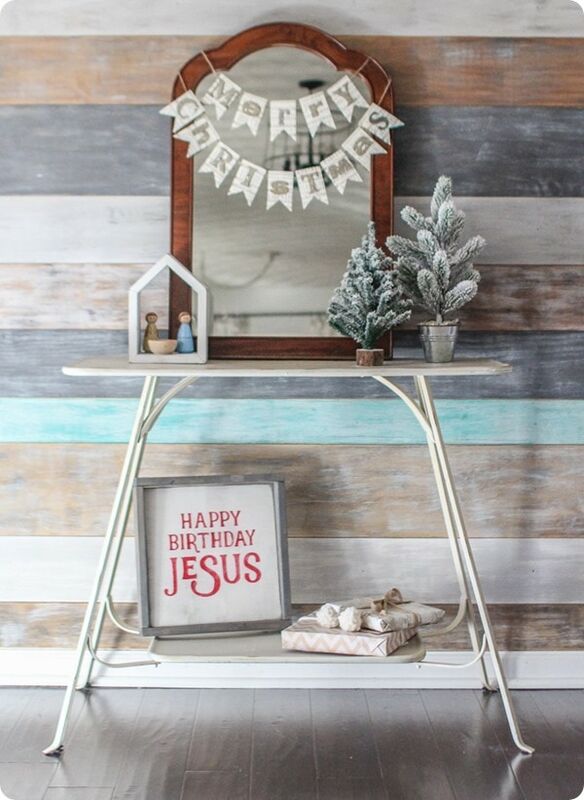 A few of my favorites are the colorful shiplap, hombre curtains and your advent count down frame. Super creative and inspirational! Thank you for sharing! Thank you so much Angie! You are so sweet! Beautiful decorations as always!! And I LOVE that couch, it’s so fun! Thank you Sarah! I love it too! I really like the simplicity of your Christmas decor. Your table center piece is beautiful. 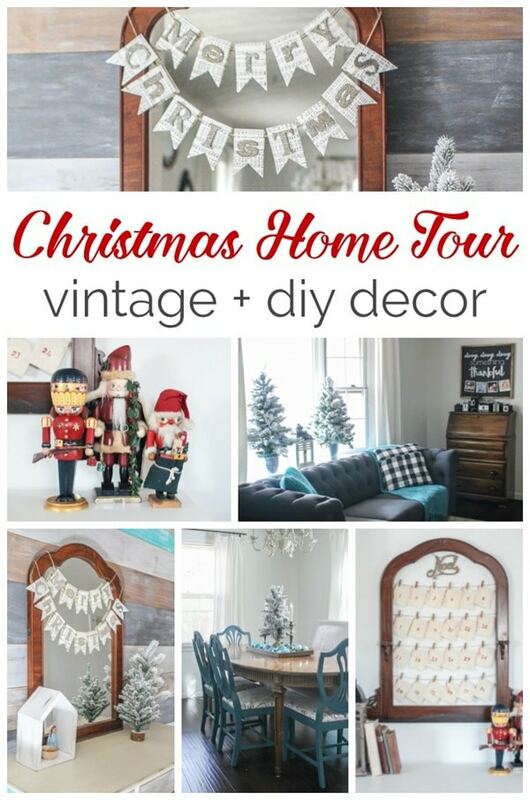 While i have done Christmas posts in the past of my tiny home and then my tiny 570′ farmhouse, this year I am completely not motivated to decorate either one for Christmas. However, it is nice to find holiday cheer on other blogs. 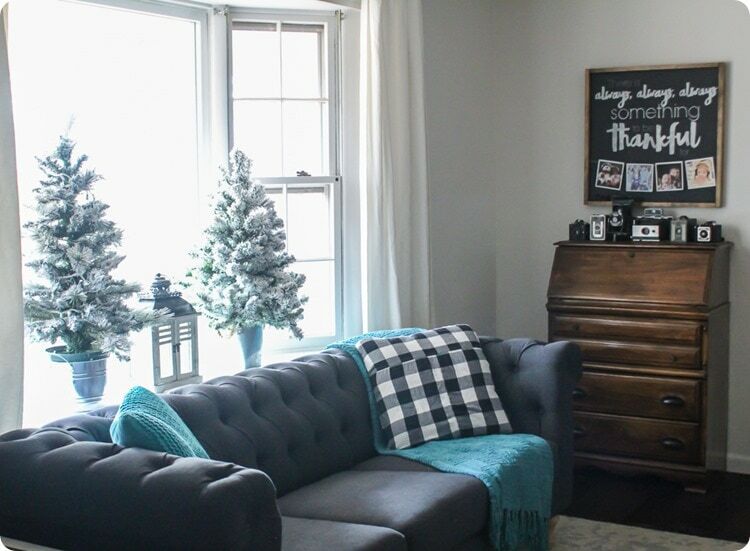 I really like that some bloggers seem to be re-using the same decor from last year and are not buying into the constant ‘in our face’ commercialism, which can easily tempt us to feel we need to buy more and more new stuff to make our nests pretty. It is a vicious cycle that I too succumb to, some years. It is wonderful to see contentment with the items we already have in our possession. Your home is way more inspiring than posts i see where people go out and buy whatever is so called “trending” that year. Your home is lovely and the simplicity is what makes this a great post IMO. Blessings. Thank you Tonita! You are so right – I don’t have the time, energy, or money to be buying new Christmas decor every year! And it is so tempting to think that is the only way but I think it is much easier to be creative and original when you use what you have. And I am super intrigued by the idea of your tiny farmhouse. I definitely need to check that out. I love your Advent Calendar. Your tour is beautiful! Happy Holidays! Everything looks fantastic! 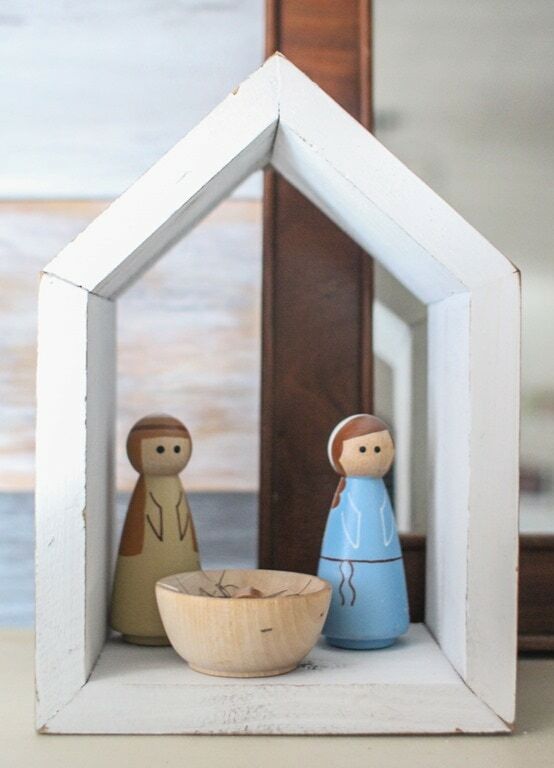 I love the little peg doll nativity. I would love to find one for our home. And the advent! Carrie, your house looks stunning! I love the vintage touches and your pretty centerpiece! No fancy tables here either – my kids would get tired of moving it when we eat! It’s all so beautiful!! Carrie, your house looks beautiful! I love your new sofa, camera collection and what a fun tradition your husband had with getting a nutcracker every year. 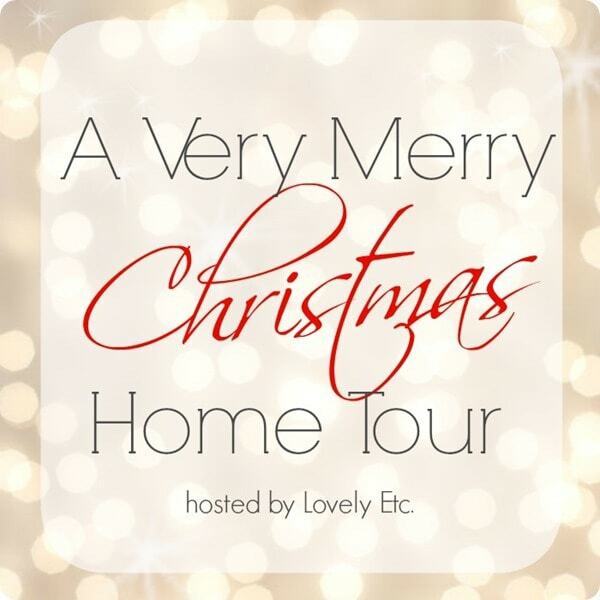 Thanks so much for all your hard work in putting this blog hop together. Hope you have a good rest of your week! Love all of your festive touches! That Advent calendar is adorable, and how fun to have all of those vintage cameras! I love that centerpiece, too. Thanks for organizing such a fun tour! Happy holidays! Thank you so much Meg! And I have to confess that’s only maybe 1/3 of my vintage cameras – I just can’t resist them! Well this is just beautiful Carrie! Those flocked trees in the bay window are simply gorgeous. I love all your sweet DIYs! Thank you Karen! I can never have too many flocked trees! Your tours are always so warm and inviting, Carrie! I love that you are carrying on the nutcracker tradition. So sweet! I have all the heart eyes over your vintage camera collection. And the new couch is gorgeous! I love the site. I would love to win the paypal money. I have started a new creative adventure and would put the money towards that. Merry Christmas! Thank you Donna! Merry Christmas and good luck on your new creative adventure! Carrie, You’re tour is just so beautiful and welcoming! I love all the vintage touches!